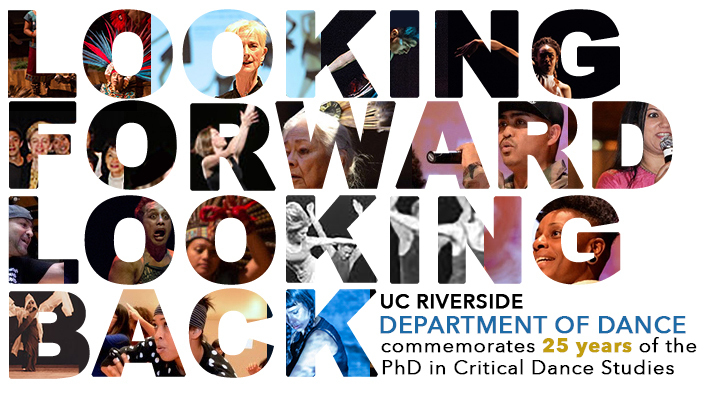 2018-19 marks the 25th anniversary of UC Riverside’s Ph.D. program in Critical Dance Studies (previously Dance History and Theory). To commemorate this historic occasion, the UCR Department of Dance is organizing a daylong series of events, which seek to highlight and honor the work of artists, teachers, and scholars who have passed through the department over the years. We hope the event will be an opportunity to be in dialogue with alum, faculty, and the public about the past, present, and future of Dance Studies as a field, and to collectively and critically look back as we look forward, and look forward as we look back. Speakers and performers include MFA and PhD alumni of the department from 1997 to 2017 as well as current faculty and graduate students who will animate the space with a range of dance(d) offerings, including lectures, performances, films, workshops, and performative talks. Come join us on February 9th, 2019 for a day of stimulating conversations, food, performance, and dancing! This event is free and open to the public. Please register here and follow us on Facebook. For the full schedule and more information visit dance25y.ucr.edu or check out our Facebook event page.